Welcome to the official Will Killeen website! "The king of the slide guitar"
News on forthcoming performances, CDs, booking info plus video footage of this spectacular performer! 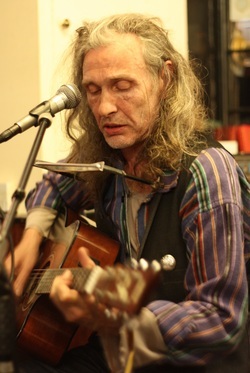 Will Killeen is a highly acclaimed Irish acoustic blues guitarist, singer and songwriter. He has a totally unique style; celtic roots mixed with American blues. You can expect songs from early blues standards through to Dylan classics delivered with inimitable percussive guitar and whirling vocals. He's also considered to be one of the foremost slide guitar players in Europe today. Will Killeen was born in Mayo, Ireland. He taught himself guitar from the age of 10 then, influenced by Howlin' Wolf, Doc Watson, The Pretty Things, Robert Johnson, Bob Dylan and the Rolling Stones to name a few. Soon he was performing around London and once replaced Rory Gallagher when Taste was formed. Will's unique-Blues guitar style shows influences from a mixture of Country, Celtic, Eastern and Rock music. He plays regularly at countless venues and festivals around London and the rest of England, in Ireland, Wales, Scotland, Italy, Germany and the United States. A dazzling player with a huge repertoire of songs, Will is a walking blues history manual, taking you on a journey from Robert Johnson and Elmore James through to an unlikely but brilliant version of "Duelling Banjos" - all on one acoustic guitar! It may all have been said before about Will, and his fans will know what to expect, but for the uninitiated, you will be dazzled by a brilliant mix of Elmore James/Robert Johnson and Bob Dylan and more, by a simply stunning guitarist. PS Will is also a successful fine artist who specialises in painting portraits and horses in oils. See 'Gallery' to view some of his work.